People love candy! It doesn’t matter what age they are, people love to eat rich chocolate sweets. Apart from the gratification of making something from scratch, making your own candies allows you to control the ingredients. No complex chemical names to be pronounced when recanting ingredients to tasters, but do spare your audience the truth about just how much fat and calories they contain. I once made the mistake of describing both caramel and toffee as a “critical mass”. As much as they loved the candy, nobody wanted to hear this. Nevertheless, they are the hydrogen bomb of candies; you just can’t pack that much sugar and fat together as densely any other way. Ergo, delicious, no? Making candy yourself gives also you the power to choose and alter the recipe. If you like milk chocolate more than dark, change the recipe to suit your taste. Do you want to use only organic ingredients? Go right ahead. Finally, home-made candies bring another factor that many people don’t always know how to appreciate: freshness. 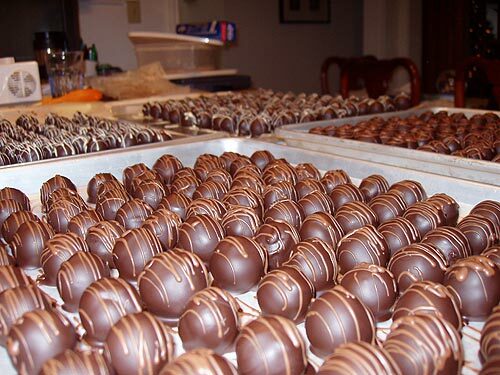 Have you or your friends had a truffle that was only a day old? Less than a week old? Freshness—combined with quality ingredients—yield a taste experience that few people are accustomed to. There is a mystique surrounding candymaking. People assume candy is very difficult to make—the truth is that only some candy is hard to make. Granted, for some people, baking cookies from store-bought dough is a feat, but making the candies you will find on this site is not very difficult. 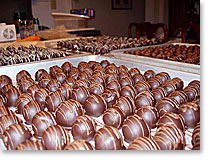 Most people simply have not even tried to make their own candies. Home-made candies make for good eating and great gifts. I have been giving candy as gifts since 1996 and I am still amazed at how praise will continue to roll in months and even years after people have received my candies. For the gift goes well beyond the pool of intended recipients, who then proceed to share the candy with their close friends and family. Then, when I finally meet these people for the first time, they experience a flavor flashback and extol the enjoyment the candies provided them. It’s like they had a kidney transplant and just found out I was the donor. I have heard stories from people that don’t give any of the candy to their children. One parent rationalized, “My kids don’t appreciate candy like this—they think all candy is good. I’ll share when they are old enough to know.” I typically prefer to deliver my candies in person, usually during a holiday gathering. Some of my regular recipients have recently adopted a far less deceptive strategy when receiving their candy. Although everyone present at the gathering receives one of my candy packages, each recipient will graciously accept theirs and quickly place it to the side. They learned in years previous that upon tearing open the packaging to sample—or even only to witness—the candy inside, proper etiquette would obligate them to offer samples to others in the room. What a noob! Seasoned recipients thus truly appreciate the ornate cellophane packaging that cannot easily be opened with the bare hands, as it offers another excuse to save them for later. Once the others depart they can retire alone to a locked bedroom and indulge upon their prize. This entry was posted on Sunday, December 3rd, 2006 at 11:03 am	and is filed under Candymaking, Essays. You can follow any responses to this entry through the RSS 2.0 feed. You can leave a response, or trackback from your own site. Many congratulations on the beta launch of a fantastic site. I wish you well with it. I love your candy and the pictures, they look delicious! I make a lot of candy myself and I recently invested in a digital thermometer. I saw your blog on candyamking in which you talk about digital thermometer being off by 10 C. Can you tell me the make of this thermometer? Hi Mary, the thermometer I was using that had poor accuracy compared to my tried and true alcochol based one was this one. Looks like there have been similar experiences reading the reviews that appeared after my purchase earlier last year. I think I bought this last year on the advice of a review in Cooks Illustrated (which I still love and respect). I think it was a runner up next to the ThermoWorks Thermapen, which costs twice as much. I’ve heard great things about the thermapen from a variety of sources, but for $85 plus shipping, I think it should be switchable between °C and °F. I’m content with my old fashioned thermometer for now, but if someone were to give me the Thermapen, no complaints!